(Nanowerk News) Since Fukushima, few people still consider nuclear power as a safe technology. The explosion of Deepwater Horizon was yet another incident revealing the dangers involved in the hunt for fossil fuels. Despite the public attention and outrage at these events, neither the concept of environmental citizenship, nor the United Nations Framework Convention on Climate Change has prevailed in the struggle against environmental degradation. Economic growth offsets efficiency gains, while strategies for energy sufficiency are usually not seriously considered. The global average primary energy consumption is 17 500 kWh primary energy per person per year. This corresponds to a continuous requirement of 2000 W. A typical person in the Western World continuously uses 5000-12 000 W. On average, people in some Asian and African countries only need fractions of that. In the 1990s, collaborators at ETH described the vision of a 2000 W society, in which each person in the developed world would cut the overall power demand to an average of no more than 2000 W and emit no more than 1 ton ofCO2 per year without lowering the living standard. This would permit a redistribution of resources in favor of less developed countries without accepting an overall increase of the total world resource consumption. Action toward a more sustainable society, for example, a 2000 W- and 1 tonCO2-society, must be taken by individuals but further incentives must be set. 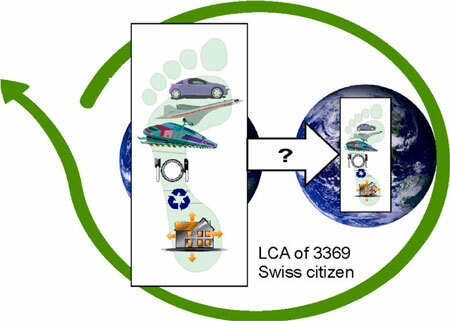 In order to provide individuals with detailed information about their mitigation options, researchers in Switzerland took the results from a survey of environmental behavior of 3369 Swiss Citizens, and combined them with life cycle assessment. They reported their findings in the Aptil 2, 2013 online edition of Environmental Science & Technology ("The Western Lifestyle and Its Long Way to Sustainability"). Results from this bottom-up approach show a huge bandwidth of the ecological footprints among the individuals interviewed. The researchers conclude that a continuous consumption of not more than 2000 W per person seems possible for the major part of the population in this society. However, it will be far more difficult not to exceed 1 ton CO2 per capita.